You can create a copy of an existing event by clicking the Duplicate button beside the event within the events list. The new duplicate event will be saved as an admin-only event, and will be automatically opened in view mode. The word (copy) will be appended to the name of the duplicate event to distinguish it from the original one. If your event list is filtered to display upcoming events, you'll have to switch the filter to display admin-only events in order to see the new event. 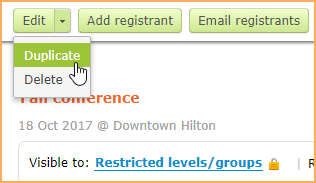 All event settings will be duplicated, other than event access permissions, multiple sessions, and the list of registrants. If you have repeated or recurring events, you can set up a generic version of the event and copy it to create each individual occurrence. You can also duplicate an event from its event details by clicking the down arrow beside the Edit button then clicking the Duplicate option. After duplicating an event, you can modify the duplicate event without affecting the original event that you copied.